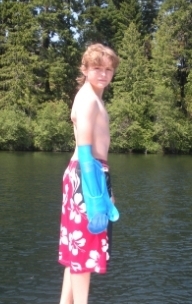 Here’s a photo of my 13 yr old son using his arm cast cover for the first time. We own lake property, and when the prospect of not being to swim because of his cast came up, he was really upset. My mother-in-law uses one of these for her PICC line she has placed for her chemotherapy, so she recommended it to him – we even paid for next day shipping so he could receive it before we went to our lake property last weekend. He was really happy to not have to sit on the sidelines and watch everyone else swim, and his cast stayed perfectly dry. Thanks for such a great invention!